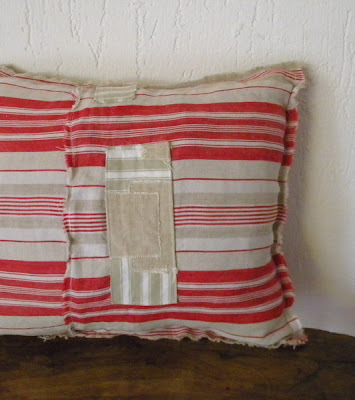 These pillowcases are recycled from vintage French ticking fabric. This kind of sturdy cotton was in the past used extensively in France to make mattresses. I found these pieces at various flea markets here in the south. 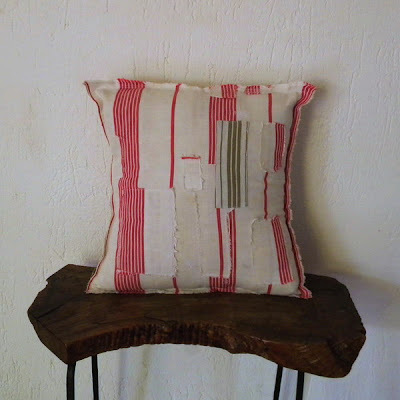 The idea for Reclaimed pillowcases came from seeing how my mother-in-law meticulously mended her children's clothes. Jeans were patched and re-patched at the knees. Holes in shirts were camouflaged with fabric of similar print. It spoke to me of love, frugality, and a natural environmental awareness. 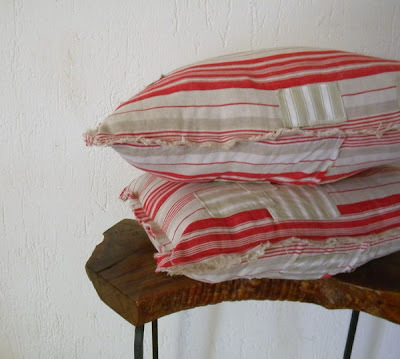 Vintage "toile à matelas," or ticking fabric is quite popular in France now. Many crafters use them to make bags and scented sachets. Most, however, look for fabric in almost-pristine condition. Lengths that have too many holes or that are stained are ignored. And yet these pieces to me are somehow more interesting than their fresher counterparts. They have lived - if we can apply the term to inanimate objects - and are not afraid to show it. I have taken the tattered and stained vintage ticking I have collected, and mended them, repairing holes and patching over major stains. The original mending I found on them, those made by previous owners, I have left intact. Some stains I left alone - proud marks of the fabric's history. 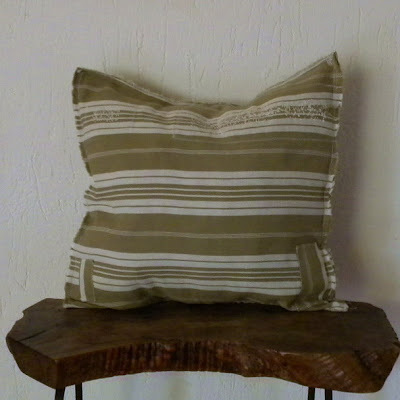 You can find these pillowcases at the Reclaimed section of the shop. Love them, they're beautiful. 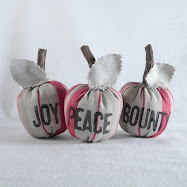 Will check out your reclaimed section, love your store! These are absolute treasures, Cynthia! And the way you described the story of their flaws made me love them so much more. This is what REAL beauty is all about!